You can drive as much traffic as you want to your website but if you don’t convert that traffic into phone calls, emails, submitted forms or transactions, you’re just wasting time and money. There are essentially 3 categories of landing pages. The choice of which is largely dependent on the specific strategies and goals of the campaign. - Standalone Landing Pages: These are typical of specific promotions or specific products or services. - On-Site Landing Pages: These often include the homepage or service or product pages. - Microsites: These are typically small, multi-page websites with a single focus and a built in sales funnel. The 6 Styles of Landing Pages…and when to use them from Kreative Webworks, Inc.
1 – Squeeze Pages: The objective of a “squeeze” page is to capture the contact information of the visitor to harvest the lead at a later time or as part of a scheduled lead nurturing strategy. An example of lead nurturing might be setting up a series of pre-written emails that would be automatically sent to the consumer over a period of weeks, building up interest and culminating in a sales pitch or special offer. 2 – Infomercial Landing Pages: These come in a couple of different flavors, but you’ve probably seen the ones that resemble the old style sales letter that is mostly text and sensationalism. Just like the classic late night infomercials on TV, they try to verbally make their case as to why you can’t live without their product or service. They typically scroll in perpetuity punctuated only by periodic offers you can opt-in to and thus put yourself out of your pain by succumbing to their offer. 3 – Viral Landing Pages: The goal extends past merely converting your visitors into customers, but to enlist them to tell their friends as well. It might be a funny video or a game that is somehow branded to your company via a subtle logo or product placement as part of a greater branding campaign. 4 – Microsites: Yes, the Cadillac of landing pages because it requires a bit more commitment. This is essentially a mini website with its own URL and custom design. These are often the destination of choice for larger investments in the form of paid advertising such as Pay-Per-Click, print and TV ads. 5 – Product Specific Landing Pages: This is a very common, but useful type of landing page because it probably already exists. Typically just an existing page on your website that contains all the information on a specific product or service. 6 – Homepage: Typically has the lowest conversion rate because the home page is like the index in a book. It’s the jump-off point for the entire contents of the rest of the site. As such, it is unfocused by nature. Landing page design is more about psychology than anything else. The idea is to persuade a visitor to your page to do a very specific thing (give you their contact info, request a demo, or the holy grail of marketing… a transaction). What is the goal of any marketing campaign? The obvious answer would be to generate leads. Whether it is organizing an event or advertising on television or in the print media, the end goal is to generate leads that can be converted into sales. Every branding activity that a business engages in has to support this objective. Simply put, a landing page is a web page that helps businesses capture leads. It is different from a Home page, which usually serve as the doorway to generic information about the various products, solutions, and services offered by the business. As such, a typical Home page has too many elements vying for the visitors’ attention. A targeted landing page will work towards compelling a visitor to take the specific and desired action. The impact of your landing page can be measured by analyzing the number of visitors who convert. Tools are available to measure the number of visitors. These tools will also provide you information on the means by which they landed there – was it your SEO strategy or your PPC campaign or your social media activities or even your direct mail campaign. If your campaigns are attracting a lot of visitors but none are converting into leads then the problem might lie with your landing page. The solution lies in enhancing and optimizing your landing page to maximize conversions. Informational landing page: If you want to present yourself as a thought leader then you can create an informative landing page, which displays content that is relevant to your visitor. Ideally, the information should center around the keyword that brought the visitor to your landing page in the first place. Action-oriented landing page: This is a landing page with a clear call to action. It could be oriented towards convincing a visitor to buy a product or capture contact information through an online form. If making a sale is the objective, you have to ensure that previous interactions with you provided the visitor enough compelling reasons to do so. If capturing information is your goal then you can do so by offering valuable content. A good landing page needs to target a particular action. Leading visitors to your Home page, for instance, can prove confusing. The visitor might have been searching for information on a particular keyword. Now unless your Home page immediately offers information related to that keyword it is likely to leave your visitor confused. More often than not, this will result in a quick exit from your website, and thereby, a missed opportunity for you. You need to be very clear about what you want your visitor to do once they land on your website. Only then can you increase the possibility of converting your traffic into actionable leads. Below we have listed a few measures you should take to optimize your landing pages in 2013. Singular purpose: You need to be absolutely clear about the targeted traffic and the action you desire from them. Minimize distractions. Eliminate unnecessary copy, graphics, form ﬁelds, and links. Provide clear and simple call to actions. Do not confuse your visitor. Make it easy for them to focus on your call to action. Short lead form: Visitors hate filling forms, so the longer your lead form the more the number of visitors who are likely to drop off. Keep it short. Capture only information that is necessary to stay in touch. Relevancy of content: Ensure that the content on your landing page is relevant to your keyword. Highlight the benefits of engaging with you for business. 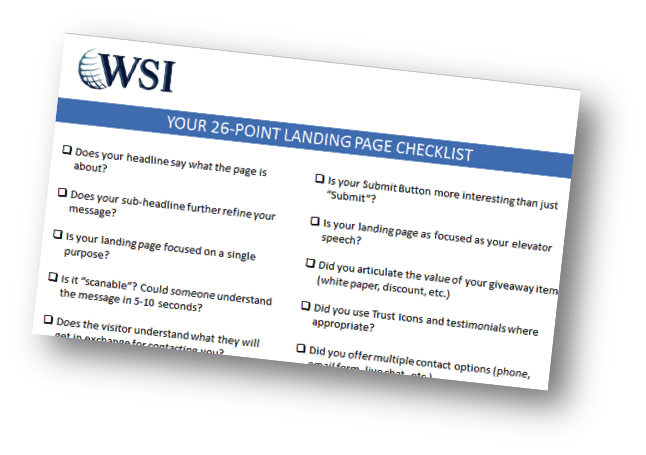 Ideally, your landing page headline should match the link your visitors clicked to get there. Call to action: Make sure your call to action (CTA) is clearly visible. Use directional cues to direct attention to your CTA. Have CTA links spread across the page in order to make it easy for visitors to take action whenever they are ready. Responsive design: Think like a user. Test your page to check whether it provides information that is relevant to the keyword they used. Is it visually pleasing? Is the messaging consistent throughout? Transparency: Visitors will always be wary about sharing their contact information. Clearly state what you intend to do with the information you collect. Ease any concerns they may have about the information falling into wrong hands. Highlight your contact information such as phone number and address. Provide links to your social media handles at the bottom. Test thoroughly: Creating a landing page is only the first step. Use real-time A/B or multivariate testing to continuously test the various elements on your landing page and determine what resonates best with your visitors. Improve your page accordingly. On April 25, Chuck Bankoff, Director of Web Services for Kreative Webworks will be conducting a public webinar where he will outline the common mistakes businesses make when it comes to their landing pages and why these can instantly kill your campaign conversions. In addition he’ll also share 6 steps to effective landing page design that will help ensure your overall paid advertising success. Kreative Webworks is a Digital Marketing firm in Orange County California since 1999. Why is Landing Page Design so critical to your Marketing Efforts? A landing page is, literally, where your online visitors ‘land’. It is your web page that is displayed when a visitor clicks an online advertisement, or a link from search engine results pages, or scans your QR code with a smart phone. This may or may not be your home page, but it definitely needs to be a page that is designed to convert quality leads into customers. About links to other sections of your site that they may want to visit—do this carefully, without distracting them too much! How can you improve your landing pages for greater conversion? Headlines. The page must open with a few attention-grabbing lines that highlight the benefits to the prospect. Visual appeal. Good visual design supports the content. However, the wrong graphics or too many images can distract from the offer and conversion goal. ‘Scannable’ pages. People should be able to scan or read through the page quickly, so use bullet points, simple sentences and crisp content. Reinforce the call to action. No two visitors read a web page in the identical manner. To make sure your call to action is not missed, reinforce it more than once on the page and ensure that it is clearly visible. Focus on a primary keyword. Define your product or service for each keyword and drive everything on the page to it. This means having many landing pages — at least one per ad group and ideally one for your each of your top keywords. Less confusion and decision making for your visitor means better conversion rates for your landing page. Simple design. Simpler pages always work better for lead generation. If you find that some elements like navigation bars, visual clutter, and links to other sections do not aid the visitor in their decision making process, get rid of them. ‘You’, not ‘we’. Write about the prospect – more of ‘you’ and less of ‘we’. Your visitors only care about how taking that step (your call to action) will benefit them. Ask for less. Keep your form simple. Get only as much information as you need immediately; you can always collect more during your lead nurturing process. ‘App’ less. Yes, not all computers run the latest fancy graphics or video apps, so think about whether you want your lasting ‘brand image’ to be a dialog box that says “you can’t view this site because you don’t have the latest version of…”? Your landing page does not always have to be a final destination for a visitor. Use your discretion and decide whether or not your landing page can encourage further engagement with the same target audience. Without distracting from your specific conversion goal for that page, provide one or two teasers or links in the corner that allow them to explore more of your products or services. For instance, if your landing page promotes your new software product, you could benefit from encouraging registration to your upcoming free webinar about how to use the product. It pays to think beyond the short-term objectives of a landing page and integrate your online strategies for the long term. Use “click paths” to capture implicit information, and design the landing pages to capture additional information about your leads, such as the keyword used, the search engine they came from, and the ad they clicked on. A ‘thank you’ page is a must after you convert a lead. Other than being courteous, it’s also a great opportunity to develop the relationship by making another offer, promoting your blog, asking for feedback, or running a poll. 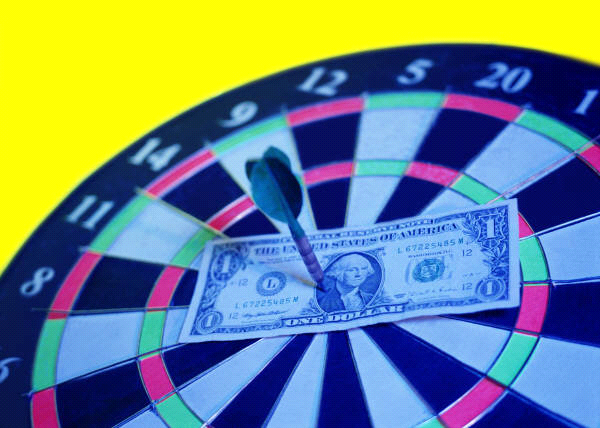 Don’t waste your online advertising budget by sending clicks to your home page! While a great looking website can grab the attention of your visitors, a strong landing page will keep them involved and get them to buy your products/services. The landing page is the most important persuasion point for the user. Create targeted, product or service focused landing pages that simplify customer activity and improve conversions. The more compelling and clear your offer is, the more qualified your prospects will be. As a result, you will drive better conversion and garner greater return on investment. For more specific information on HOW to go about designing an effective landing page, take a look at our SlideShare presentation Landing Page Design: Common Mistakes and Tested Techniques. It covers all the details you will need to design or supervise an effective landing page. • You get 1000 visitors to your website each week. • That gives you 10 new customers each week. You decide that you need to double the amount of new customers each week. What is easer; to double the amount of traffic to your website to 2000 visitors each week, or to make changes on your website to convert more of your existing visitors? • That gives you 20 new customers each week with the same amount of traffic. Imagery, color & layout: Carefully select images that complement the site’s content. Using effective imagery contributes significantly to keeping your visitors on the site and improving your website’s bounce rate. Similarly, color affects behavior so choose the right color palette to portray your product and service in the right light. The layout of your site should help guide visitors to your sales funnels. Remember, this is about the users’ experience, not yours! Personas: Think of your target audience and the different personalities you are trying to attract. Consider how they will look at the information on your site and identify their trigger points to ensure they see your offer as the right solution for their needs. Contact forms and phone number: Avoid making a visitor search through your site for a phone number. By simply adding your phone number or a small contact form to every page makes it easy for your visitors to contact you. It’s also a subconscious invitation for them to pick up the phone. This is simple but can get you outstanding results. Clear, concise content: Remember, people don’t read on the Internet, they “scan”. They see pictures headlines and bullet points. So develop content that is straight to the point! Use effective titles and bullet points to increase readability and visitors’ understanding that they have found what they are looking for. Call-to-action: Even if your content is clear and customer-focused, you can’t depend on it to get visitors to convert. Just like dealing with customers face-to-face, you need to “ask for the sale”, or conversion, with inviting, easily clickable calls-to-action. These are simple but effective ways to increase your conversions quickly.